Pokhara—Pokhara Chamber of Commerce and Industry has expressed its dissatisfaction over the excessive increment in integrated property tax rates. 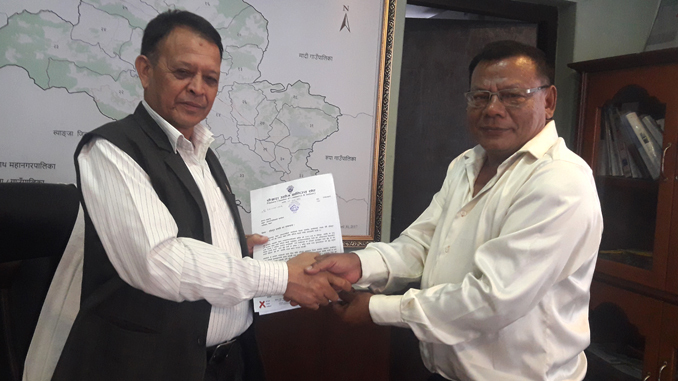 A delegation team headed by PCCI Chairman Bishwo Shankar Palikhe has submitted a memorandum to Pokhara Metropolitan City (PMC) Office Mayor Man Bahadur GC and asked to amend the newly imposed tax rates on Friday. PCCI also expressed its sorrow that Chairman Palikhe and Nepal Chamber of Commerce and Industry Gandaki Province Chairman Sanjiv Bahadur Koirala had verbally informed about the difficulties of people by increased tax rates and asked to minimize them but metropolitan office remained reluctant over their request. PCCI also urged the metropolitan office to form a evaluation committee comprising of experts before fixing the tax and integrated property tax rates in modern way. PCCI also reminded the earlier understanding that the integrated property tax won’t be increased for five years though the rates of the land goe up as per the time being. During the delegation, Pokhara Metropolitan City Mayor Man Bahadur GC said that he was well awared about all the tax rates and assured the delegation team that the meeting of metropolitan city that would be held today would decide something new with minimization of tax rates. The delegation was represented by PCCI senior vice president Rabindra Bahadur Prajoo, PCCI vice presidents Gokarna Karki (Chamber) and Bindu Koirala (Commerce), General Secretary Damu Adhikari, deputy general secretary Arjun Pokhrel and executive member Narayan Paudel.